Sign up for our Nature Adventure Walks! Come and join us for 3 hours of exciting, hands-on learning in this Nature Adventure Walk at Dairy Farm Nature Park! You (or your child) will get to learn about scientific concepts through experiential learning, with elements of adventure incorporated to provide a thoroughly engaging and enriching learning experience. To join in the fun, email nature.trailblazers@gmail.com, or call 81801601/91551644. We will be more than happy to answer any enquiries and provide more information about our Nature Adventure Walk. Please indicate your interest at least 10 days before your chosen date. We hope to receive your support for our programme, and we look forward to your enthusiastic participation! For the first time ever, Trailblazers collaborated with Team.doc to organize the Get Wild! Camp! Thanks to the support of our team members and volunteers, as well as the enthusiasm of the 23 participants, the camp was a great success. The participants managed to gain much knowledge of Nature and the history of Dairy Farm, while having tons of fun at the same time in the natural environment. This is because Get Wild! Camp is partly based on its predecessor, the highly successful Nature Adventure Walk. This camp includes the best activities from the Nature Adventure Walk, and other new activities were added as well. Through these games and activities, the participants gained knowledge on nature such as pollination, plant types, animals and their characteristics, predator-prey relationships, and much more. The camp provided an informative and exciting way for children to learn more about the natural environment. One particular activity was the Treasure Hunt, held at the end of the camp, which was a popular hit with the participating children. Slips of paper containing answers were placed in tetra paks and hidden in various corners of Dairy Farm Nature Park. They also had clues which led the children to other tetra paks in the area. The children had a very exciting time exploring the nature park and searching for the hidden tetra paks. At the end of the Treasure Hunt, there was a Speed Question Quiz, which tested the participants on the concepts and knowledge they learned during the camp itself. The participants were extremely eager in answering the questions, and shouts of ‘Eureka!’, the word used when they know the answer, could be heard all over the Wallace Education Learning Lab. The camp garnered very positive response, which meant a lot to our team as we encountered some difficulties along the way, and it was a whole new experience for us. The participants described the camp’s activites as ‘fun’, and said that they would be most willing to come for the next Get Wild! Camp. The parents, too, called our camp ‘a good effort’. Our mentor for the Young ChangeMakers grant also commented positively on the camp. Get Wild! Camp was an excellent opportunity for the Trailblazers to gain experience in organizing larger-scale nature camps. It was also the first time we collaborated with another group for a project, and the first time we opened up our nature activities to the public. This camp was indeed a great milestone for our team! The Trailblazers are truly glad to be able to serve the community once again, this time on a larger scale. We hope that the children of Singapore can learn about the natural environment in an interactive and engaging manner. Hence, we will continually strive to improve our nature activities and outreach, and draw children even closer to nature! Another exciting Get Wild! Camp will be coming up soon. For further details, watch this space! What better way to spend the morning of Labour Day than discovering the wonders of nature and spending quality time with your children? We promise an educational and interactive time of fun-filled activities that your whole family will enjoy. To join in the fun, email nature.trailblazers@gmail.com, or call 81801601/91551644. We will be more than happy to answer any enquiries and provide more information about our Nature Adventure Walk. Please show your support for our first ever public Nature Adventure Walk (previously only open to schools) by indicating your interest by 17 April 2010 (Saturday). We look forward to your enthusiastic participation! The annual Get Wild! Camp is here again! 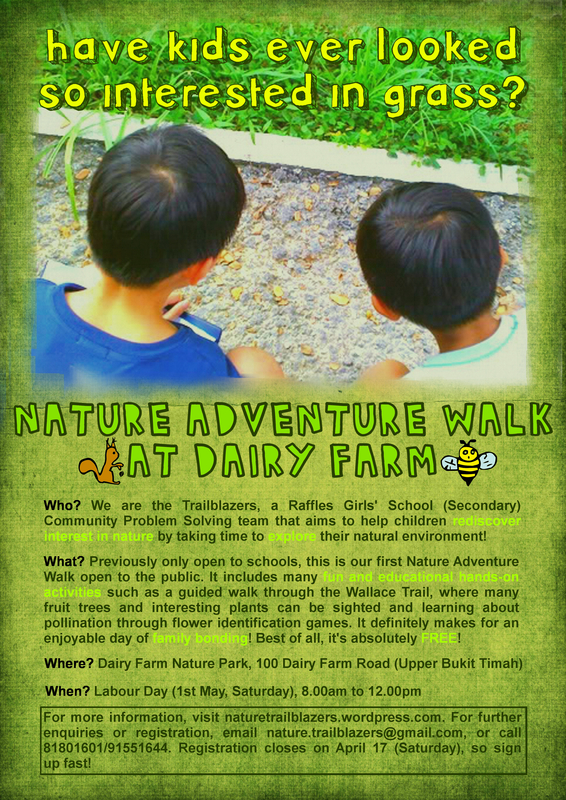 This is an educational and interactive camp about nature as well as the history of the Dairy Farm, and is jointly organised by Trailblazers and Team.doc of Raffles Girls’ School. (1) To stimulate children’s interest in interacting with nature. (2) To instil in children the desire to conserve nature. (3) To increase children’s understanding of their natural environment. The camp will allow children to get closer to nature to explore scientific aspects of the natural environment in a very enjoyable and authentic way. On top of that, they will learn about the interesting history of the Dairy Farm. Our Nature walks conducted in 2009 proved to be exciting and informative, and the Get Wild! Camp includes the best of these activities, as well as new and engaging activities. Hence we would like to extend our invitation to Primary 4 to 6 students to participate in this camp. Get Wild! Camp 2010 will be held on 13 March (Saturday), from 8.30am – 2.30pm, at Wallace Education Centre, located in Dairy Farm Nature Park (100 Dairy Farm Road). The camp fee is $3, which can be paid on the day of the camp. Lunch and refreshments will be provided, so if you have any special dietary needs, please let us know. If you are interested in participating in this camp, please email lai-jieru@hotmail by 10 March, Wednesday. More information such as how to get there and what to bring will be included in a reply to your email. We look forward to your positive reply! The mission of the Asia Humanitarian Forum is to bring together compassionate hearts and available resources within Asia for global humanitarian and environmental benefit. AHF aims to make humanitarian and environmental issues relevant and urgent for everyone. The Trailblazers team was very fortunate to participate in such an admirable cause on 16th January 2010 at the National Library. As our project aims to educate the young on the natural environment, we set up an exhibition booth under the Roots & Shoots Group Singapore. We were at the exhibition hall from 10am to 10pm, where we introduced our project to fellow AHF participants as well as members of the public. The visitors generally showed a high level of interest for our cause. We conversed with many people with a similar passion for Nature, and managed to acquire contacts for further updates and collaborations. There were also people who signed up for our Nature Adventure Walk itself. The Trailblazers team were most pleased when our booth visitors praised our project for its originality and significance to society. Our team was glad to be able to extend our project’s outreach, as we managed to communicate our cause on a different platform, and reach out to a more diverse audience. Not only did we inform other people about our cause, we also learnt much more about various philanthropic and environmental projects all over the world. Our team had a lot of fun with the Reverse Vending Machine – a device that automatically recycles used drink cans. There were meaningful panel discussions held, such as ‘Fight Climate Change with Diet Change’ by NUS Students Against Violation of the Earth, which educated the audience on how our current meat-filled diet is drastically harming the environment. Individuals from philanthropic organizations, such as Mark Philpott from the Humaneity Group, gave inspiring speeches on serving one’s community. Upon listening to such speeches, our team felt very enlightened by their respective causes and inspired by their passion for these causes. We are now more driven to bring our project to greater heights and further our involvement in the community. The Trailblazers team is very thankful for this opportunity to participate in such a meaningful forum. Not only did we extend our project’s outreach, we also were inspired by other organizations. If given the chance, we would love to go for a similar event again! With the enthusiasm of the students and the determination of the Trailblazers team, our NAW went very smoothly indeed. This was despite the day’s condition – the sun was sweltering hot, and the mosquitoes seemed to swarm us at every opportunity. However, this was easily solved by taking a few breaks along the way, so that the pupils can rest and have snacks. Even though doing this took up more time, we know that ultimately, the welfare of the children is most important. The children all had positive comments regarding our Nature Adventure Walk. One boy had told a Trailblazers member that he found nature ‘boring’, and ‘spent most of (his) time playing computer games’. However, at the end of the NAW, he described the experience as being ‘quite fun’. This is an example of the attitude we have during this project: We understand that children are unable to gain an appreciation of nature within 3 hours, and therefore that is not our aim. What we strive to do is present nature in a fun and fascinating manner, such that even if they are not suddenly devoted nature enthusiasts, they can still leave with a heightened interest in the natural world. Their teacher-in-charge, Ms Michelle Tan, was very impressed with our Nature Adventure Walk, and hopes to collaborate with us for future learning journeys as well. Here is what she had to say: The good intermix of games, art, hands-on planting and scientific theory was one of the most engaging nature programmes we have experienced. Well done! 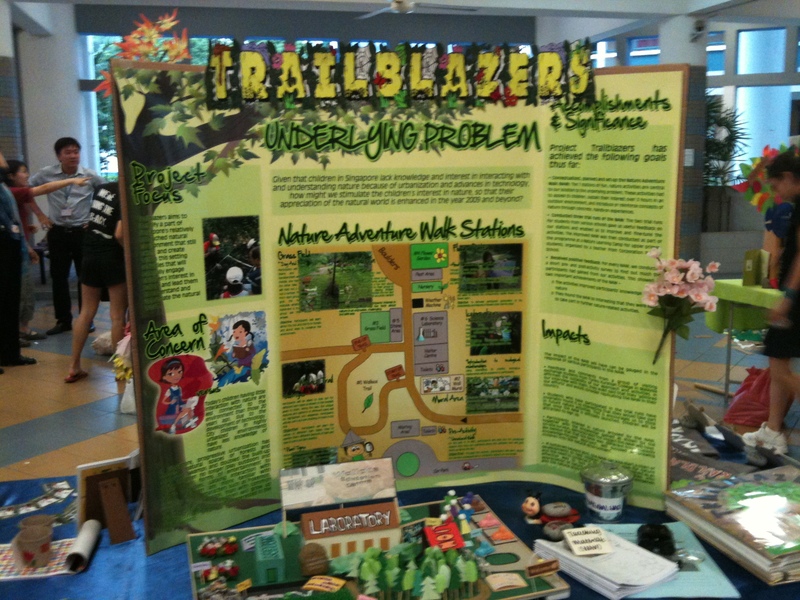 The Trailblazers team is very glad for this opportunity to serve the younger generation once again! Special thanks go Ms Michelle Tan, who have agreed for us to conduct the trail and made arrangements for this activity to take place, as well as the six participants for their positive outlook and enthusiasm! Today concluded a gruelling three days of intense comeptition for Trailblazers. We participated in the Future Problem Solving Programme competition, in the Team Community Problem Solving section, held in Raffles Girls’ School (Secondary). 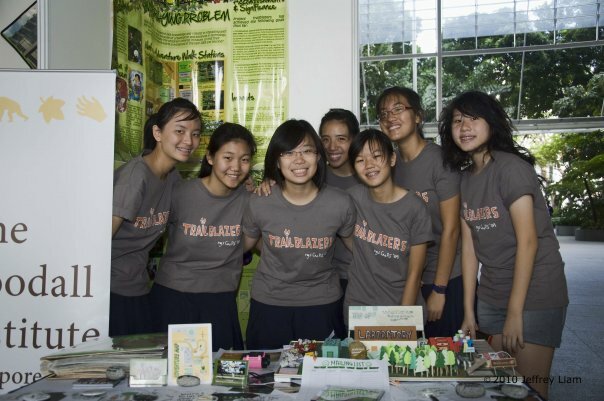 Trailblazers arrived on Thursday (19/11/09) for the set-up of our booth, showcasing posters about our project, a scrapbook, a video, a 3-dimensional map of our Nature Adventure Walk, teaching materials and publicity materials such as postcards of a map of the Wallace Education Centre, badges, t-shirts, namecards and calendars. On Friday (20/11/09), we had an interview with the evaluators, telling them more about our project and showcasing our scrapbook and our display. Finally, on Saturday (21/11/09), there was a CmPS fair where the public visited our booths. Trailblazers managed to sell our project to the public, and gave away calendars, namecards, and also managed to get the contact details of many primary school teachers and children. Lastly, the results of the CmPS National Finals were announced. We are proud to announce that Trailblazers has clinched the second prize for the CmPS Middle Division category, and will be representing Singapore in the International Conference next year in Wisconsin. all participants of our NAW, for being ever so enthusiastic. For more information about our project, please go here. If you have any queries, please drop us an email at nature.trailblazers@gmail.com, and we will be more than happy to address them.